We collect you at your hotel and take you to one of the best places around Kiruna for auroral photography. While waiting for the Aurora Borealis we tell about the nature and the sami culture. We also teach you the basics of northern lights/night photography, using either your own camera equipment or ours. 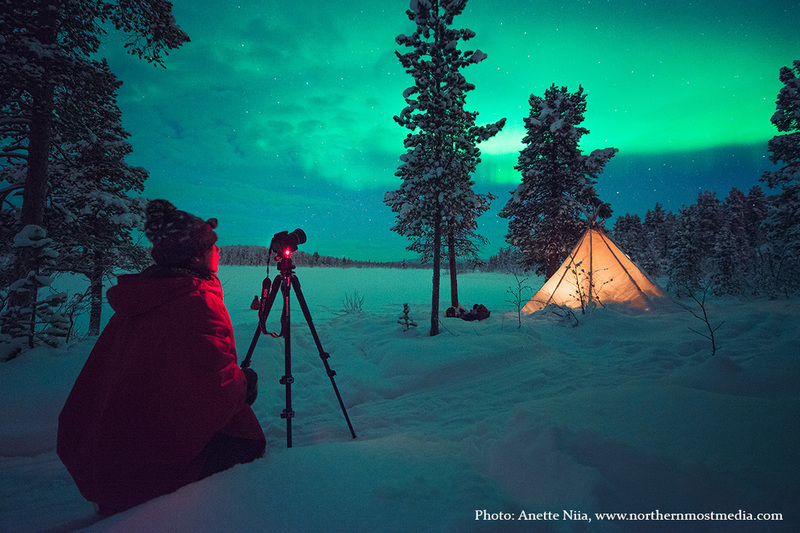 We take photos not only of the Northern Lights but also of ourselves and of the nature around us. If it is not an auroral night we will teach you how you later, with your own camera, can create beautiful auroral images. We end the evening with a cup of coffee or tea by the fire. Depending on the aurora forecast and the weather we have several locations to choose from and during the trip you will be able to warm up either in our Sami tent, in a cabin or by the open fire. However, we recommend you to prepare with warm clothes for the season, mittens, gloves and a warm hat. Children from 10-15 years old are welcome to book the tour. If you have younger children please contact us for a private tour.